A landmark is a structure that is at least 30 years old and has “a special character or special historical or aesthetic interest or value as part of the development, heritage, or cultural characteristics of the city, state or nation,” according to the New York City Landmarks Preservation Commission, the agency that makes designation decisions. A landmark is not always a building. It could also be a bridge, a park or even a tree. Greenwich Village has more landmarks than any other district in the city. What are the different types of landmarks? Individual landmarks are exteriors of structures, from skyscrapers to churches to private homes. Examples include the Woolworth Building, built between 1911-13 and designated in 1983; and the Bronx County Courthouse, built between 1931-34 and designated in 1976. Interior landmarks are building interiors that are usually open to the public and meet the requirements for individual landmarks. Many interior landmarks are theaters, courthouses and office buildings. Private residences and religious properties cannot be designated as interior landmarks. Scenic landmarks include parks and streetscapes like Prospect Park and Ocean Parkway. Historic districts are neighborhoods that offer a “sense of place,” like Greenwich Village in Manhattan and Jackson Heights in Queens. In an area designated as a historic district, each building is regulated as considered an individual landmark. When did the city begin designating buildings as landmarks and neighborhoods as historic districts? Mayor Robert Wagner signed the New York City Landmarks Law in 1965. The U.S. 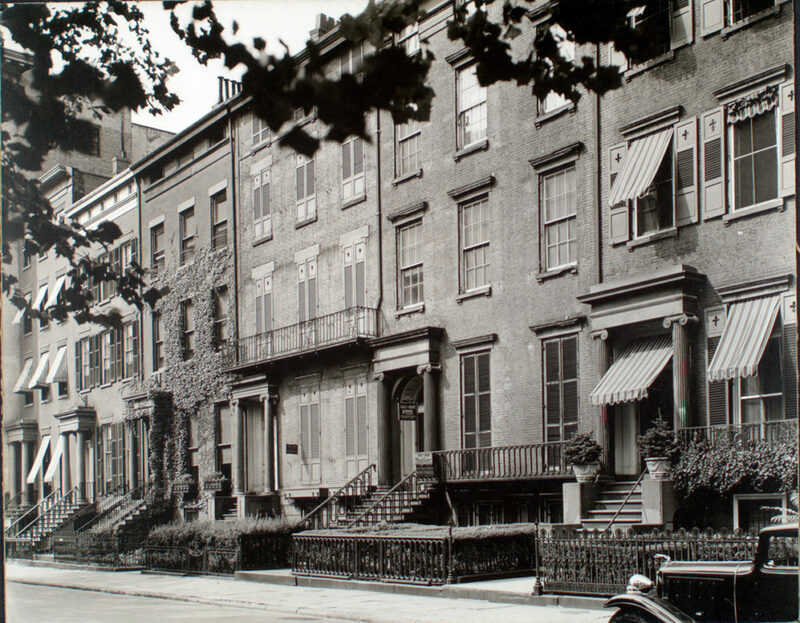 Naval Hospital in Brooklyn, the boathouse in Prospect Park and the Old Merchant’s House in the East Village were among the first individual landmarks, and Brooklyn Heights was the first historic district. What is the process of becoming a landmark? “It varies from building to building,” said Karen Ansis, manager of New York City Historic Properties Fund and City Ventures Fund at the New York Landmarks Conservancy. Sometimes, Ansis said, it’s clear that a building should be designated as a landmark once a request comes in. At other times, the fight could go on for decades. John Antonides, editor at the Brooklyn Museum, first came across Hubbard House in Gravesend, Brooklyn, in 1990. “It was chance, really, that drew me to the Hubbard House,” Antonides said. He was editing a book about historic homes and read “Old Dutch Houses of Brooklyn” by Maud Esther Dillard. He decided to drive by the neighborhood where the homes once stood and found the Hubbard House was still there. “Finding a survivor, though, was always a thrill,” he said. During the 19 years between his original request and designation, Antonides fell in love with the Dutch farmhouse, purchased it and asked neighbors to back his crusade. He built a relationship with the New York Landmark Conservancy, which supported the push for landmarking. The house received landmark status in 2009. Once someone files a request, the commission evaluates it. If it makes the decision to move forward, the commissioner and chair determines if the entire commission should vote. The 11 commissioners then review and vote on whether or not to hold a public hearing. If there is a majority vote, the commission schedules a hearing. Before the hearing, the research department of the commission writes a detailed report, sent to the property owners and commissioners. In addition to public testimony at the hearing, the report is the main document used to determine landmark status. Who has to sign off on a building or area becoming a landmark or historic district? At the public hearing, commissioners vote on designation. At least six commissioners must vote in favor of designation in order for the property to become a landmark or the neighborhood to become a historic district. When the commission approves designation, it files a report with the City Planning Commission and City Council. It also sends a notice of designation to the City Clerk’s office. For individual, scenic and interior landmarks, the Planning Commission has 60 days to review the report and send its own report about the potential impact of the designation to the City Council. The Planning Commission must hold a hearing for historic districts before filing a report. While a City Council vote is not required, the Council has the right to modify or disapprove designation with a majority vote within 120 days of the landmark panel’s decision. A majority vote is necessary to change designations, and, the mayor has five days to veto. Then, the Council has 10 days to override the mayor’s veto with a two-thirds vote. How many landmarks are there in the city? Most of the more than 35,000 landmarks in the city are situated in the 139 historic districts and historic district extensions in the five boroughs. The total number also includes 1,360 individual landmarks, 117 interior landmarks and 10 scenic landmarks, according to the Landmarks Preservation Commission. What other role does the Landmarks Preservation Commission play? The commission regulates buildings and sites once they are designated. Once a structure becomes a landmark, property owners have to maintain the building. Before performing any work on the exterior or interior, outside of ordinary repairs or maintenance, the owner must obtain a permit from the commission. How many historic districts and historic district extensions are in each borough? There are 78 historic districts and historic district extensions in Manhattan, 33 in Brooklyn, 13 in Queens, 12 in the Bronx and 3 in Staten Island, according to data from the Landmarks Preservation Commission. What is the difference between a New York City landmark, New York State historic place and a national historic site? The landmarks commission regulates city landmarks. The New York State Office of Parks, Recreation, and Historic Preservation regulates both state and national landmarks on behalf of the National Parks Service, according to Daria Merwin of the New York State Office of Parks. The office writes a report and presents it to the New York State Board for Historic Preservation. If they vote yes, it is added to the state register and moves on to review by the National Parks Service, which designates national historic sites.